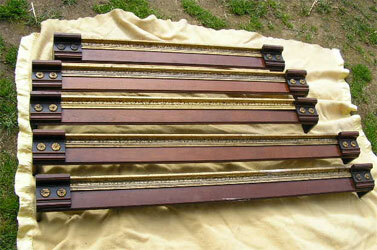 Two pair and 1 single Victorian window cornices. Walnut base wood, with applied gold leaf and black lacquer finishes. All easily cut down to your window sizes as needed with no notice of modification. 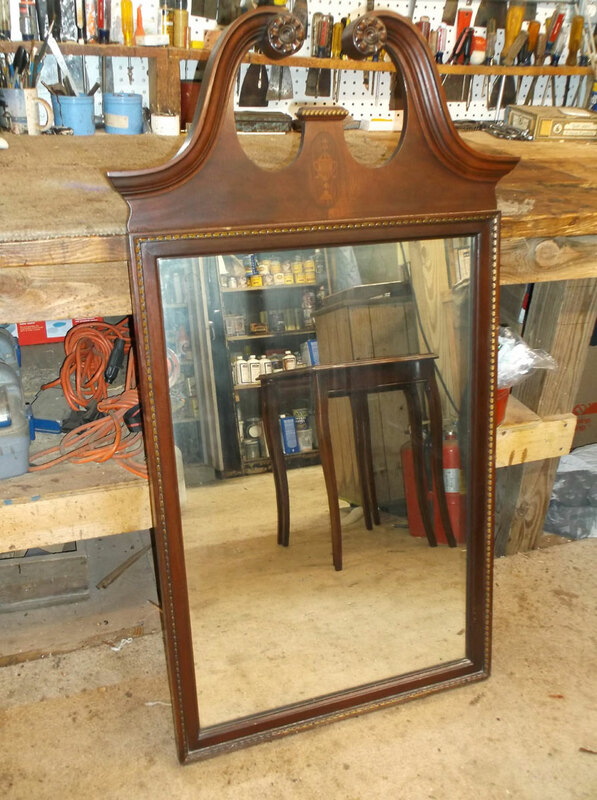 Beautiful blonde bird’s eye maple framed mirror. 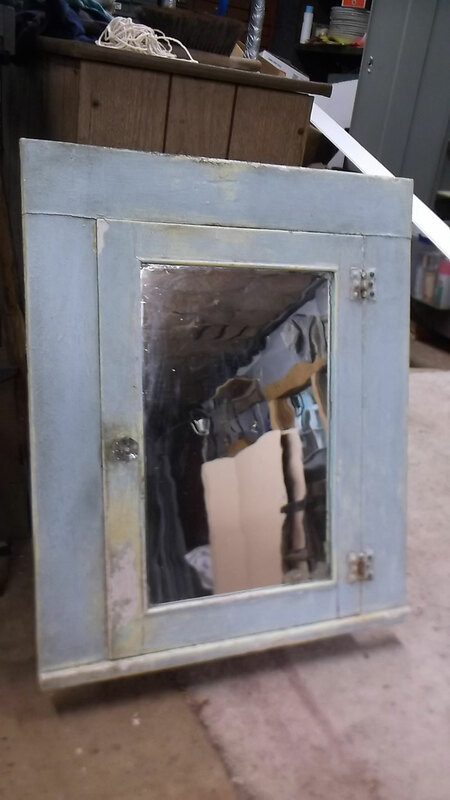 Mirror glass new. Hang vertically or horizontally. Very pretty and feminine! 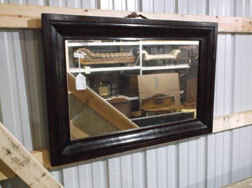 Oval metal frame, cast decoration on top, flat glass. Bentwood construction, Has folding shelf as shown, six hat pegs, beveled mirror. 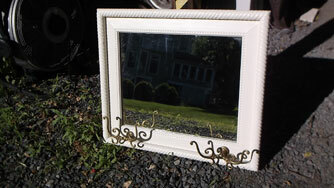 Metal picture frame w/Victorian ribbon decoration on top, convex or “bubble” glass. 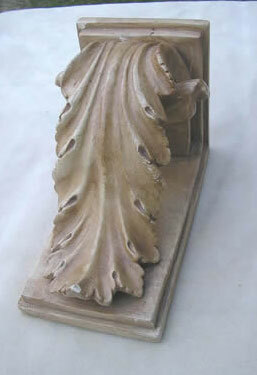 Visit Just In & Recent Acquisitions for our latest arrivals. Welcome to Stonehouse Antiques ! Late 1800’s, solid walnut, gracefully curved and carved in all the right places! TOO KOOL! Mounts into a corner, push on right side of door and it rotates like a lazy susan! 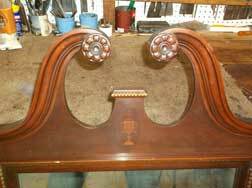 Good walnut color and patina, most likely 1950’s era. Signed A. L. Law, circa 1900. Painting depicts a woman and child returning home on a winters afternoon. Woman is carrying a bag of branches on her back, probably to start a fire against the cold. Will hang either horizontal (shown) or vertical. 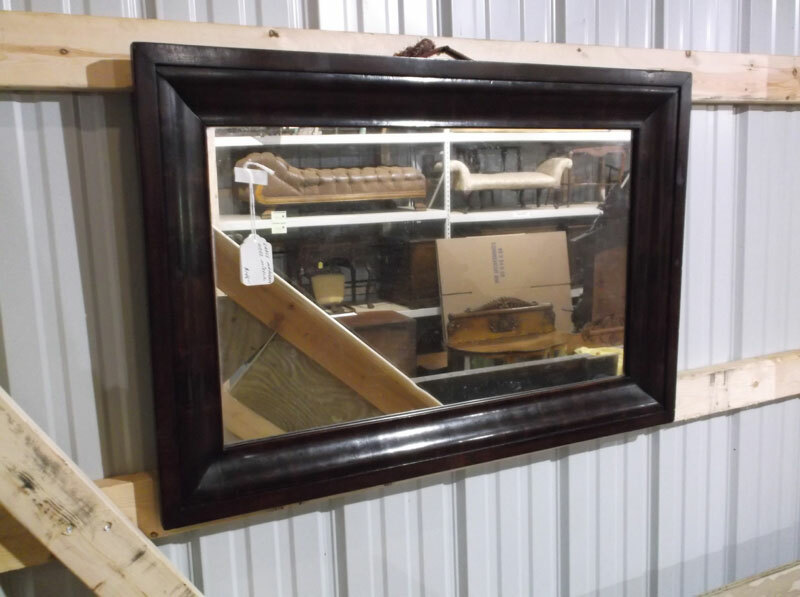 Solid Mahogany, good color and graining, mirror a little cloudy, adding to it’s character. 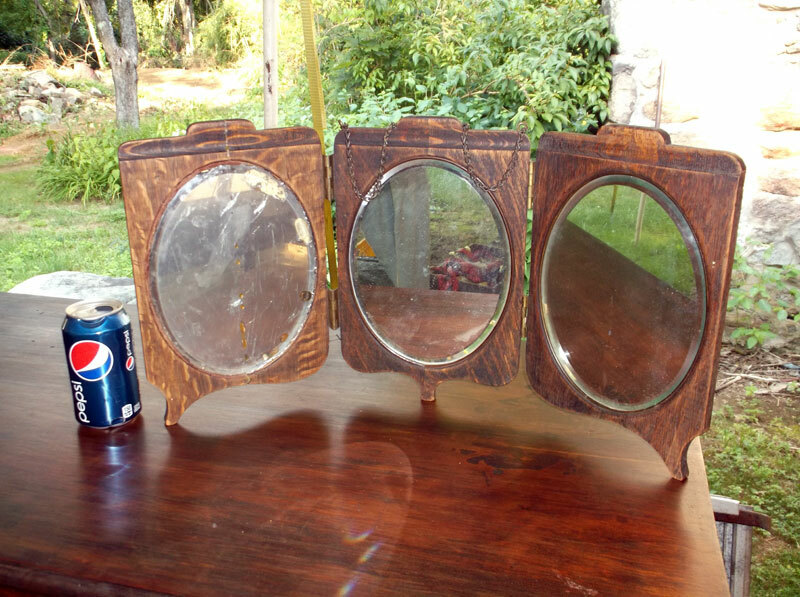 Will install new mirror at cost if desired. This is not a joke, it is a copy of an actual magazine ad dating from about 1900. Be sure and read entire ad! You may buy the framed copy, or and unframed copy. Fits a standard 11 x 14 frame. It makes for a great gift for that “special person” who’s always concerned about their weight! 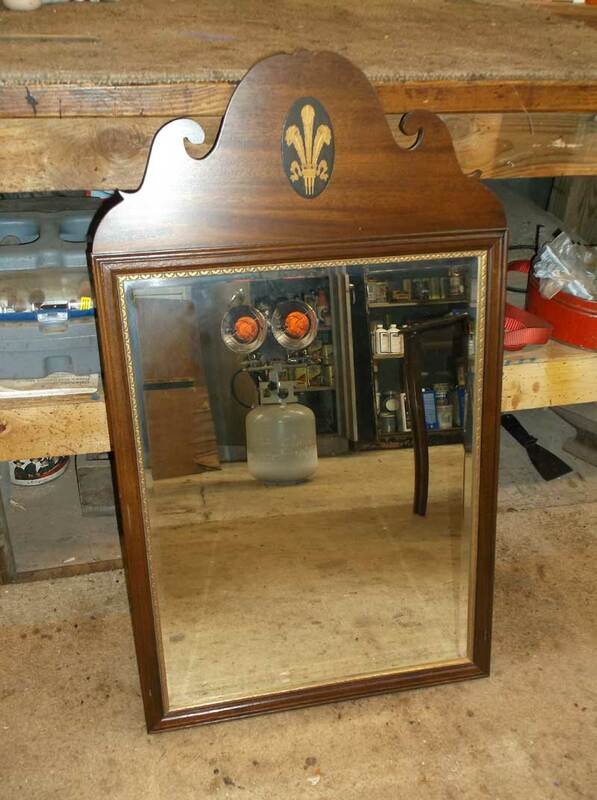 Good Mahogany color, gilt center ornament and mirror surround. Beautiful flamed mahogany, inlaid satinwood band around glass, smaller size. Spectacular cabinet with three doors, interior shelves, mirrored center door. All raised panel construction throughout. Can be wall hung, or sit on a table, dresser, shelf, wherever. Solid Walnut, small corner shelf, will fit just about anywhere! 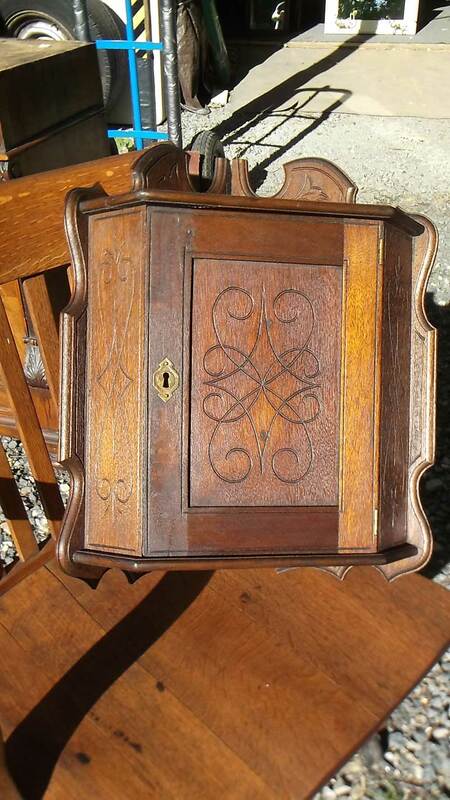 Very sweet little corner cupboard! Solid walnut, carved door, side panels and picture framed body around cabinet. Single shelf inside. Very small, can fit most any corner!